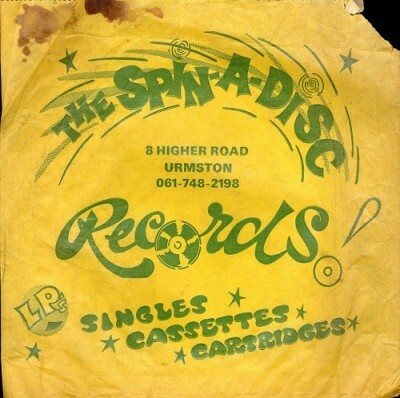 A paper record bag from Spin A Disc on Higher Rd in Urmston Manchester.Shop was in business from around 1976 - 1985 found loads a great punk records i remember the 7" covers all over the walls, the owener think his name was Steve and looked like he had just got back from Woodstock! Great Days! Yes his name was indeed Steve. His family had another shop in Ashton on Mersey. I bought most of my records from this shop in the heady days of 1976 - 79. The core of the Urmston punk scene used to meet up there on Saturday mornings before heading off into Manchester for the day's, and evenings, entertainment, heh. The shop is now a newsagent. Ah Spin A Disc, what memories. I spent a fair bit of my pocket money here on all sorts of weird and wonderful things. Steve was great, a very dry and funny bloke. The amount of people hanging out at the shop (including my sister Kirsten!) not buying anything, I was surprised he ever made any money - well he didn't, which is why they closed down! As I recall he 'discovered' Sheila Chandra (who had a minor hit with "Ever So Lonely") and had his own record label, where he was billed as "Steve Cyclepath" ! Can this be added to the Gallery: Record Shops of Greater Manchester? That's an ace bag! I worked here for a while - at first to work off the cost of a copy of No New York album. Anybody actually know Steve? I could do with finding him again. He is Steve Cummins (or Cummings). Spin a disc was opened by Neville Price whose main business was Mayfair Ciggarett Co. & CIG. supplying cigarette machines to the pubs & clubs around Manchester. He needed a second workshop/ storage facility to compliment his main business premises in Stretford . Urmson council insisted that the workshop be fronted by a retail shop - so Spin a Disc was born. In 1972 I was employed as it's first manager. It did well selling 8tracks ( remember ? ) cassettes LPs & singles. Nevilles brother ( talented artist ) painted a huge mural of a 60s type group along the main wall of the shop.As manager I kept up to date with the top 20 charts by listening to Radio 1 Johnny Walkers show Tuesday lunchtime & then ringing the main record companies to place orders ( EMI, Pollydoor,Decca,RCA, PYE) I took guidance re classical & jazz records - but think we had a good selection all the same. Cont .... open a high end Indian restraunt & our shop was in the way - they needed the space to form the kitchen area. Urmston council paid for our business to move around onto Higher Road taking over premises that used to be Barclays Bank. It took days to make a rear entrance as the wall had formed part of the banks vault & as such had thick steel cables randomly placed within the thick concrete walls. Shannons on Station Road supplied the sound system which was quadraphonic - it did not stay long in the shop however as Neville got " an offer he could not refuse " & over a weekend the system was taken down & replaced with an adequate stero system. Neville would call at WH Smith ( delivery co.) each Saturday to pick up the singles I had ordered on the Tuesday. He stayed on to help me & always treated me to a fish & chip lunch, ate in the stick room , which also meant I did not get a lunch hour ! Apart from that I ran the place myself - cleaning windows, hovering & keeping the place clean. Neville sold his cigarette business to Gallaghers for a million ( he showed me the cheque before he banked it ) & moved from Stretford to Fleetwood. Abbey National were opening a branch on Flixton Road ( converting the co-op butchers ) they advertised a 4%staff mortgage ( public rate being 15%) a no brainer for a newly wed.
Cont....( often from an advert ) & tracking it down for them via the record companies. We supplied Urmston Automatics - juke box company trading down Highr Road. Dave Ward ( Curly Shirley ) who started as a local DJ whilst running a barbers on Moorside Road - later having a regular slot on Piccadilly Comercial Radio Station. Titles ( later Blockbuster) opened on Flixton Road ( a video rental store ) with a small record dept upstairs - it stayed open until 10pm & pop videos were just starting.The writing was on the wall re independent record shops. When I think now - the value of the cigarette stock behind the shop, to fill the vending machines must have been of great value. The stock was always delivered by securicor ! . I worked I spin a disc straight from school 1976 till 79. I worked for Nev and Pat Price too. Loads of cigs machines in the back along with condom machines too!!! I ran it ordering all stock etc and was great place to work. Even got in with the reps and managed to get my hair done regularly across the road by Dave, for payment in vinyl!!! Those were the days! They sold out to Steve Cummings dad who eventually ended up running it once I left and went to set up disc and tape exchange stretford ...then Bradley's records in the arndale in Manchester. Best time to be in music!